Jupiter is the brightest planet or star in the evening sky this month. Face south and look for the brightest point of light there. If you’re looking in the right direction, you can’t miss it. Jupiter can currently be found inside the constellation Capricornus. Venus begins to wrap up its stint as morning star this month, as it’s now much lower in the pre-dawn sky. Look southeast right as day begins to break for the brightest thing (other than the Moon.) Venus remains the ‘morning star’ for the rest of 2009. Mars is now almost overhead at dawn. It is also brightening as the Earth approaches it. Saturn is now also visible in the morning sky, but it is not as bright as Venus. The Big Dipper happens to be to the lower left of the North Star at dusk this month; you’ll need a clear northern horizon to get a good look at it. 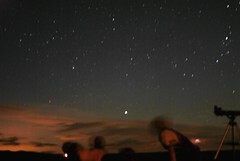 Sagittarius, the Archer, known for its ‘teapot’ asterism, is in the southwest. Look for the enormous Summer Triangle, consisting of the stars Deneb, Vega, and Altair, high in the west. As familiar summer patterns shift to the west, the constellations of autumn take center stage. The Great Square of Pegasus is high in the east at dusk. The star in its upper left hand corner is also the head of Andromeda. Facing north, you’ll see five stars in a distinct ‘M’ like shape—this is Cassiopeia, the Queen. Her stars are about as bright as those in the Big Dipper, and she is directly across the North Star from that Dipper. In fall, while the Dipper is low, Cassiopeia rides high. You will notice that November evening skies are generally dimmer than skies in summer or winter. This is because we are facing out of the galactic plane. Our Milky Way is quite flat—about 100 times as wide as it is thick. 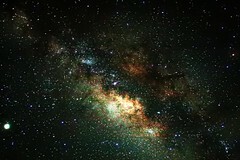 As a result, most stars, including most of the brighter stars, are near the plane of the Galaxy. We therefore see fewer bright stars when looking perpendicular to this plane, as we do when we face south on November evenings. Our Galaxy is part of a Local Group of about 40 galaxies. This group, in turn, is on the edge of the Virgo Supercluster of galaxies. It turns out that when we look up in November, we have our backs to the center of that huger supercluster and are facing our own Local Group. Thus, other members of that group, such as the Andromeda Galaxy and the Triangulum Galaxy, are high in the sky. On May evenings, when we again look out of our galaxy plane, we’ll be facing the center of the Virgo Supercluster and have our backs to our own Local Group. Today, the just-past-full Moon will pass very close to a star cluster called the Pleiades. At 9:11 p.m. and again at 10:11 (CST), it will briefly occult (hide) a couple of its stars. What angle is the plane of the Solar System (orbits of the planets) to the plane of the Milky Way galaxy? Isn’t it something like 60 or 70 degrees? The ecliptic pole (the point in the sky perpendicular to the plnae of the solar system) has a galactic latitude of 29.8 degrees. That would indicate an angle of 61.2 degrees between the solar system and Milky Way planes.